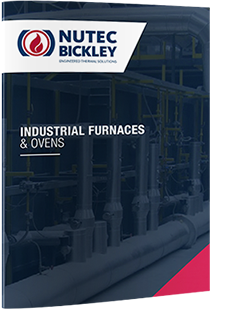 Nutec Bickley provides pusher type furnaces fabrication for continuous- indexing production in custom designs to match customer production and process requirements. The indexing pusher mechanism is located outside of the furnace and pushes a whole train of trays or containers along the length of the furnace. This type of furnace has fixed “roll-rails” or “skid rails” on top of the refractory hearth to support the trays or containers along the furnace.